To introduce a novel myopia growth chart based on a population-based survey for the prediction of myopic progression. The study included 7,695 Korean participants aged 5 to 20 years from a population-based health survey (Korean National Health and Nutrition Examination Survey IV–V). The authors collected spherical equivalent (SE) data converted from noncycloplegic refraction data. To create a myopia growth chart, data were arranged in the order of SE from hyperopia to myopia to acquire specific percentiles of the SE by age. Myopia progression rates were calculated between two specific ages in each percentile. The mean age of the participants was 11.8 years and the mean SE was −1.82 diopters (D). The SE of the 10th percentile was +0.72 D for participants aged 5 and −0.25 D for those aged 20 years, resulting in a total change in refraction of −0.97 D. In contrast, the SE of the 90th percentile was −0.75 D for participants aged 5 years and −6.73 D for those aged 20 years, showing myopia progression of −5.98 D. The myopia progression rate from 5 to 20 years of age was estimated as −0.06, −0.15, and −0.40 D/year in the 10th, 50th, and 90th percentile groups, respectively. The myopia growth chart may be used to diagnose the severity or to estimate the progression of myopia. A patient in a higher percentile of myopia for his or her age may have myopia progressing at a faster rate and thus require close observation. Myopia is among the most common ocular morbidities and is typically an underlying cause for many other eye diseases. Myopia during childhood is not just a refractive abnormality, but can also be an axial myopia that results in ocular structural change.1–4 Such ocular structural changes may cause retinal abnormalities, optic disc change, glaucoma, cataracts, amblyopia, or strabismus. The continuous increase in the prevalence of myopia globally5,6 has increased the incidence of many ophthalmological diseases. Novel treatment modalities for myopia suppression have been introduced, such as atropine eye drops or orthokeratology lenses.7 However, the cost and side effects of these treatments limit their use, especially in the pediatric population.8,9 Patients undergoing these treatments should be carefully selected to minimize the number of patients experiencing side effects. Accordingly, a prediction of myopia progression, such as an identification of those who are at a high risk of advanced myopia or rapid myopia progression, becomes important. Such prediction requires age-specific normative data of the refractive error in the pediatric population. However, it has not been clinically available until now. Reference ranges of a disease vary with age in the pediatric population. Large-scale population-based surveys can provide insights on age-specific physical changes for the pediatric population, such as height and weight growth charts, which use percentiles for an identification of the normal range. Likewise, we thought the same methodology might be applicable to refractive error change in pediatric populations. 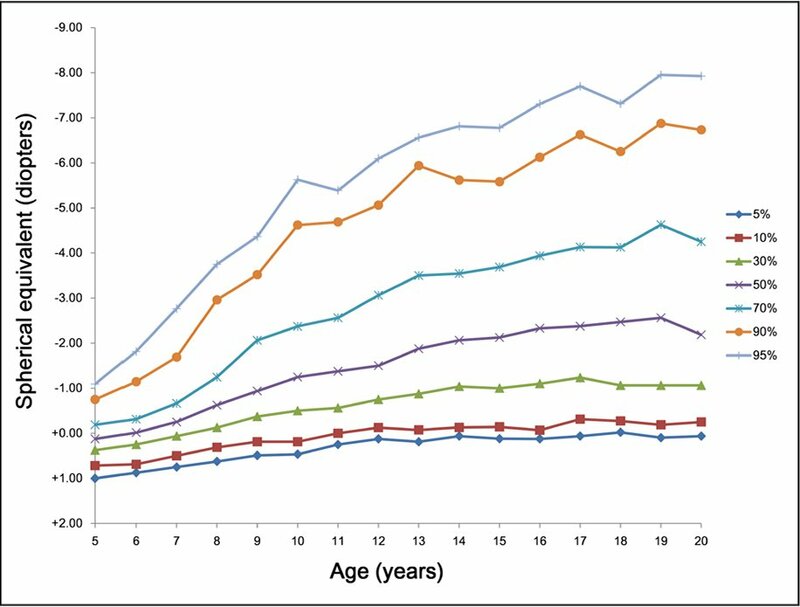 In this study, we devised a novel concept of a myopia growth chart using the national health survey data. Using this chart, we speculated a normative change in the refractive error and an approximate myopia progression rate in childhood. This study used the data from the 4th and 5th Korean National Health and Nutrition Examination Survey (KNHANES) (2008–2012), which is a nationwide, government-driven, and ongoing health survey conducted by the Korean Center for Disease Control and Prevention. The specific protocol of the KNHANES has been described elsewhere.10,11 In brief, the sample design and size were determined using a stratified, multistage clustered sampling method and planned to represent the entire population of Korea. The KNHANES protocol was approved by the institutional review board of the Korean Center for Disease Control and Prevention. This study conformed to the tenets of the Declaration of Helsinki and was also approved by the institutional review board of Kim's Eye Hospital. We collated refractive errors of participants aged 5 to 20 years. Noncycloplegic refractive errors of the participants were measured with an autorefractor (KR-8800; Topcon Corporation, Tokyo, Japan). This study included 7,695 participants of the 9,351 who participated in the survey and excluded 1,656 participants without refractive data. We acquired the mean of the spherical equivalents (SE) (spherical error + half cylindrical error) in both eyes. We sorted the mean of the SE from hyperopia to myopia to obtain the percentile of the refractive error by each age. Subsequently, we determined each refractive error corresponding to the 5th, 10th, 30th, 50th, 70th, 90th, and 95th percentiles. A rate of change in the refractive error was calculated as the refractive error difference between two specific age groups divided by the age gap. A rate of change in refractive error was calculated for each percentile group. Our previous study12 used the same data and reported that the first quarter of the total refractive change from 5 to 20 years of age was accomplished by 7.5 years of age, the second quarter by 9.1 years of age, and the third quarter by 11.9 years of age. Based on this report, the changing rate of the mean SE (diopters [D]/year) was calculated according to the age ranges of 5 to 7, 7 to 9, 9 to 12, and 12 to 20 years. Statistical analysis was conducted using SPSS (version 20.0; IBM Corporation, Armonk, NY) and Excel (version 14.0; Microsoft Corporation, Redmond, WA) software. Baseline statistical analyses for the participants were conducted, and the percentiles of a specific SE for each age group were estimated using the built-in function of the Excel program. The mean age of all participants was 11.8 years (range: 5 to 20 years). A total of 3,706 (48.2%) participants were women. The mean SE in all participants was −1.82 ± 2.23 D (range: −15.43 to +7.50 D) and normally distributed. The mean SE of the 5-year-old participants was +0.04 ± 0.86 D (range: −6.63 ± 7.06 D), whereas that of the 20-year-old participants was −2.88 ± 2.68 D (range: −11.50 ± 5.63 D). The total mean refractive change from 5 to 20 years of age was −2.92 D. Accordingly, the mean rate of change in the refractive error from 5 to 20 years of age was −0.19 D/year. The distribution of SE by age is depicted by box-and-whisker plots in Figure 1. As age increased, the SE of the participants in each age group became more myopic. Moreover, the distribution of refractive errors by age varied widely. 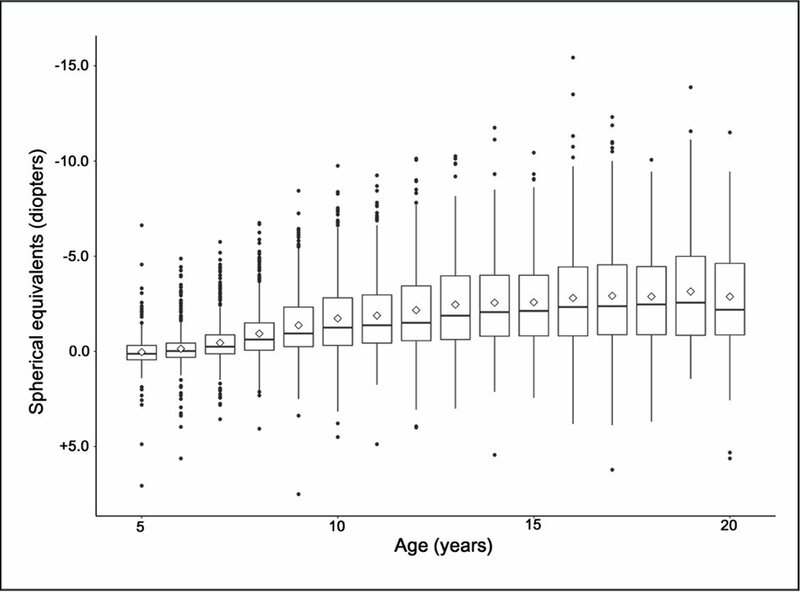 The interquartile range (IQR) for 5-year-old participants was only 0.75 D. By contrast, the IQR for 20-year-old participants was 3.78 D. The differences of SE in the upper 50th percentile were greater than those in the lower 50th percentile (Figure 1). 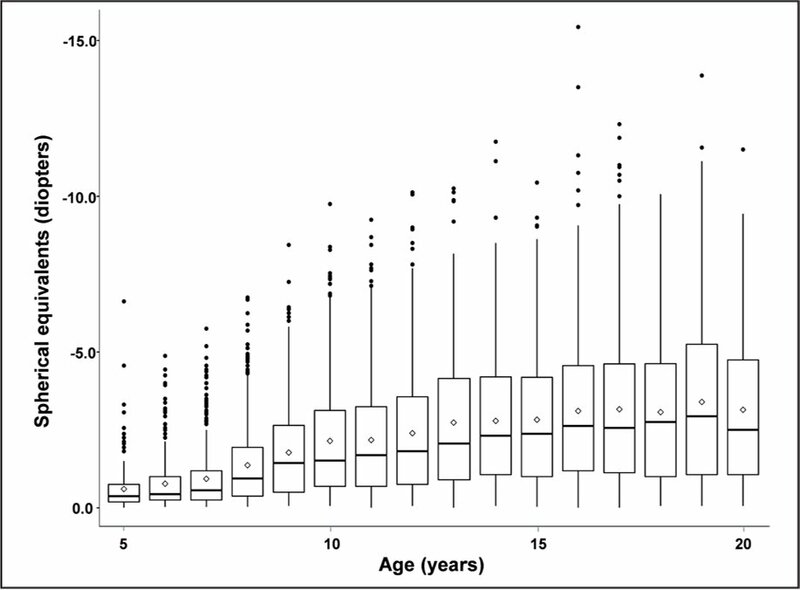 The distribution of SE by age for only participants with myopia (SE less than emmetropia) is also depicted in Figure 2. For each age group, the IQRs for the participants with myopia were wider than the IQR all of the participants. Box-and-whisker plots of the spherical equivalents (SE) by age. Y-axis (SE) was inverted. Boxes denote interquartile range (IQR) (the 25th–75th percentiles), and whiskers denote the range of 1.5 × IQR of SE in each age group. Horizontal lines in each box denote the median value (the 50th percentile) of SE, and diamonds denote the mean SE in each age group. Dots denote outliers in each age group. The median and mean of SE became myopic as age increased. The SE distribution varied widely and right-skewed as age increased, indicating that myopia progression accelerated as age increased. Box-and-whisker plots of the spherical equivalents (SE) by age for only participants with myopia (SE less than emmetropia). As in Figure 1, the interquartile range (IQR) (boxes), the range of 1.5 × IQR of SE (whiskers), median values (horizontal lines), mean values (diamonds), and dots (outliers) were depicted. The refractive error corresponding to each percentile was described in Figure 3 (myopia growth chart). The total amount of refractive change from 5 to 20 years of age increased as the percentile increased. The refractive error of the 10th percentile group was +0.72 D for participants aged 5 years and −0.25 D for those aged 20 years, resulting in the total refractive change of only −0.97 D. By contrast, the refractive error of the 90th percentile group was only −0.75 D for those aged 5 years but −6.73 D for participants aged 20 years, resulting in the total refractive change of −5.98 D. The total refractive change of the 90th percentile group was approximately six times more than that of the 10th percentile group between 5 and 20 years of age. Myopia growth chart. The lines connected the spherical equivalents (SE) corresponding to the same percentiles in each age group. As age increased, the differences in SE in the upper 50th percentile were higher than those in the lower 50th percentile. The mean rates of the refractive change according to the age ranges are presented in Table 1. The rate was −0.06 D/year in the 10th percentile participants, −0.15 D/year in the 50th percentile participants, and −0.40 D/year in the 90th percentile participants from 5 to 20 years of age. The rate was the highest in the age range from 7 to 9 years among the same percentile groups. In this study, we created a myopia growth chart and acquired the refractive error corresponding to each percentile. In the myopia growth chart, we identified detailed and age-specific distributions of refractive error in patients 5 to 20 years old. The myopia growth chart also provided detailed estimates of myopia progression rates. The participants in higher percentiles were likely to show rapid myopia progression. As such, we can assume that myopia would progress more rapidly in patients in higher percentiles than in those in lower percentiles. Several studies reported myopia progression patterns during childhood. Zhou et al.13 investigated the refractive error change of children 6 to 15 years old for 5 years in a district in western China. They reported that the mean change in the refractive error was −0.43 D/year. Myopic progression was more prominent in disease onset in young individuals, women, and participants with high myopia. Another study investigated the refractive errors of 928 children aged 7 to 9 years for 2 years in Singapore.14 It also reported that the risk factors for myopia progression were disease onset in young age and high myopic SE at the beginning of the study. In another population-based study, Fan et al.15 estimated the rate of myopia progression as −0.63 D/year for the myopia population and −0.29 D/year for the nonmyopia population. Collectively, these population-based studies reported that myopic progression was more rapid in younger and more myopic participants for their age. These findings were comparable to our results. The myopia growth chart demonstrated that participants with early-onset myopia belonging to the relatively high percentiles were expected to have rapid myopic progression. The severity of myopia can be determined more specifically using the myopia growth chart. The value of −1.00 D is not a severe refractive error. However, a 5-year-old patient with −1.00 D corresponds to the 94th percentile. The patient might have rapid myopic progression and high myopia at 20 years of age (−6.94 D corresponding to the 94th percentile at 20 years of age). By contrast, a 10-year-old patient with −1.00 D corresponds to the 45th percentile. The patient might only have average myopia in the population of the same age. Therefore, a 5-year-old patient with −1.00 D may need careful observation, whereas a 10-year-old patient with the same refractive error may not. A myopia growth chart can be valuable in determining candidates for suppression treatment. Atropine or orthokeratology treatment can retard the progression of myopia, but it cannot stop it. In the Atropine for the Treatment of Myopia study,16 patients treated daily with 0.01% atropine showed −1.38 D progression in 5 years, resulting in a −0.28 D progression per year. Moreover, the patients treated with 1% atropine showed −0.14 D progression per year. In Korea, a previous study showed that patients treated daily with 1% atropine showed −0.25 D progression per year.17 The data suggested that atropine eye drop treatment can retard myopia progression up to −0.14 D progression per year, indicating that patients with the refractive change rate below −0.14 D progression per year cannot benefit from the atropine treatment. Based on the myopia progression chart, most participants below the 50th percentile showed a −0.06 to −0.15 D progression per year. Atropine treatment for the patients below the 50th percentile might be ineffective. The myopia growth chart can be useful to standardize participants in the study. In studies on myopic progression, the age or refractive error of controls and participants should be matched. However, when using the myopia growth chart, participants with various refractive error or age can be standardized. Thus, the efficacy of a treatment can be compared more objectively and easily. This study has some limitations. The KNHANES provides cross-sectional data. The continuity of the change in the refractive error corresponding to a specific percentile cannot be guaranteed. A cohort study for the refractive change should confirm the current findings. Moreover, the refractive data from the KNHANES are collected using noncycloplegic autorefraction. As such, the refractive data suggested in this study could be more myopic than it really was.18 However, studies on myopia screening using the same autorefractor used in this study showed that the autorefractor had reliable performance for the screening of myopic patients, with a sensitivity and specificity of 88.6% and 86.1%, respectively.19 Considering that the general purpose of a growth chart is early screening for progressive developmental abnormalities, the myopia growth chart using noncycloplegic refraction might be acceptable for screening patients at a risk of high myopia. Further studies using cycloplegic refractive data may compensate for such limitations. Considering that the refractive data can vary depending on the country and the population in the Republic of Korea has a relatively low ethnic variation, the myopia growth chart presented in this study cannot be directly applied in other countries. However, many countries already have refractive data from previous population-based studies. Thus, a myopia growth chart for specific countries and races can easily be made using those data. This study suggested a novel concept of the growth chart for the diagnosis of childhood myopia. Moreover, this study presented estimates of myopia progression rates by age and refractive error in the pediatric population. These findings may help establish guidelines for myopia suppression treatment. Choi T-H, Jeong J-W, Choi Y-Y. The effect of atropine on myopic progression in children. J Korean Ophthalmol Soc. 2005;46:1189–1195. From the Department of Ophthalmology, Kim's Eye Hospital, Konyang University College of Medicine, Seoul, Republic of Korea (DHK); and the Department of Ophthalmology, Asan Medical Center, University of Ulsan College of Medicine, Seoul, Republic of Korea (HTL).